This adorable CHARM IT! 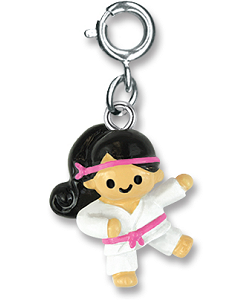 Karate Girl charm is perfect for the martial artist in all of us. Sporting her white gi, complete with pink belt and headband, this cute 3-dimensional girl has her long black hair up in a pony tail and shows her love of the sport by the big smile on her face. Whether you prefer karate, taekwondo, jujitsu, or other martial art, this fun CHARM IT! 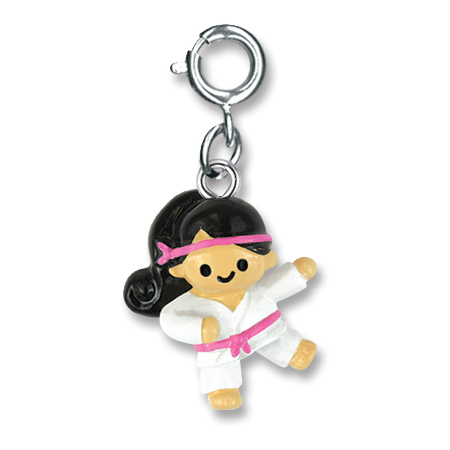 Karate Girl charm will reflect your passion for your sport. With a simple snap of a clasp, you can personalize your charm bracelets with this sporty CHARM IT! Karate Girl charm. This sporty Bowling Girl charm features a fun bowling ball and pin of pretty pink enamel with shiny acrylic stones. You'll be off to the races of fun and fashion with this sporty CHARM IT! Bicycle charm. Snap your favorite charms onto this versatile charm kilt pin and add a fun sense of fashion to purses, backpacks, etc.